Recently, I’ve been thinking a lot about the Birds of Prey tie-in comic that never was (check out art from that abandoned effort here) and about the other DC shows that have been given the comic treatment; Smallville, Arrow, Flash, Batman ’66, Wonder Woman ’77 to name a few. With so much attention on DC Comics at the moment and all the comic reboots of old shows and universes, I thought it would be awesome to see what a Birds of Prey revival comic would look like now. So, I found an awesome artist, Ben Cloutier, and commissioned him to come up with a comic cover for our beloved Birds. Happy to report, the results are pretty awesome! Added the DC Comics and WB logo for fun, but of course they have no affiliation with this project. This is just me fanboying out on what could be. Ben’s art is absolutely stellar and captures the characters in front of their Clocktower base, ready for another night out, defending their city. I would love to write a few short stories for a comic in the future, but that’s not in the budget at the moment. For now, I love looking at Ben’s art mocked up into a sort of “What Could Be” comic cover. Please check out Ben’s DeviantArt page where he posts his work and takes commissions at a VERY reasonable price, especially considering his talent. And if you happen to know someone at DC, you tell them I’ve got a great idea ready to go! There are a ton of things that fans never get to see when a show is canceled after 13 episodes. With a few notable exceptions (sidebar: Firefly fans are so spoiled! ), 13 episode shows never get good media coverage, behind the scenes featurettes, good DVD releases, or that all encompassing word for everything that fans enjoy throwing money at, merchandise! Birds of Prey left a giant, birdarang shaped whole in my childhood when it left because I knew I would never see any cool figures, shirts, comics, or even coffee mugs with my favorite characters on them. Over the years I’ve managed to put together a respectable Birds collection, but the little kid inside me was still hoping for some toys. I customized a few action figures during the show’s initial run of Huntress and Oracle and Harley to varying degrees of success, but it was my girlfriend’s recent fascination with Funko’s POP! Vinyl line that made me think of another project. So, after some time on the Funko website and a ton of research into customizing the little devils, I went about making my very own Birds of Prey POP! figures. I knew I wanted to make a Huntress and Harley Quinn figure, so my first step was to decide what base figures I would use to Frankenstein the characters together. I knew I wanted to find heads that I wouldn’t have to change, since any alterations to the heads of these toys are always very obvious. For Harley, I chose the head of the Bride figure from Kill Bill and the body of Willow from Buffy. For Huntress, the head of Emily from Bioshock fit perfectly, but the body was a bit tricky. I searched the entire POP! line for the perfect body, but nothing jumped out at me. Knowing I had to get creative, I noticed the upper body of the Emily figure was pretty spot on to what I wanted Huntress to be, even down to the corset and choker necklace. So, I took a gamble and decided to use the top of the Emily figure with the legs of the Bride figure I was already buying. Before I started working on the bodies, I removed the heads by placing them in boiling water for a few minutes. The heat weakens the plastic and the glue around the neck, making them weak enough that you can pull the heads off. Once decapitated, I got to work using a two-part resin called Magic Sculpt. I’d never used it before, but it worked perfectly. For the Willow body, I just filled in the V-neck collar so there would be a smooth surface on the front chest where I would ultimately paint the character’s diamond design. Huntress, however, was a bit more complicated. I started Huntress by cutting both the Bride and Emily figures in half at the waist so that I had the legs and torso I needed. Then, using the resin, I joined the two and filled in the gap with the character’s belt. To create the coat, I used a piece of cape from an old Justice League Unlimited Superman figure and heated it with a lighter to shape it to the figure’s body. I then glued the cape in place and used the resin to smooth it all out. The result was a little assaulting on the eyes, but ultimately right were it needed to be. Thankfully, paint and sealer saved the day on both of the figures. Then, I just had to reattach the heads and voila! The Birds of Prey figures that never were! I’d love more than anything to tell you I’d figured out a way to create an Oracle figure, but I don’t have anywhere near the sculpting skill it would take to come up with a mini wheelchair. So for now it’s Huntress and Harley, standing side by side on my desk, waiting to see who will throw the first punch. So, I’ve been starting to investigate a few BOP-related artsy projects but to tackle one of them, I have to finally face a question about the show’s finale that has plagued me for 12 years now: What the hell is Harley Quinn wearing?! This I don’t really have questions about (accept one, which we’ll get to later). Obviously, this is some kind of tight, red turtleneck that has been modified by the costume department to feature an open front with the character’s trademark three diamonds from the comics. Pair that with the red leather gloves, and things are off to a reasonable, distinguishable start. Here is where things get a little tricky though. As the gateway drug to the rest of the costume, this wide, leather (?) belt has a red design on the band and a long red sash that hangs off the back. I’ve never been able to make out the design well, but best guess is some sort of flower design. The red sash on the back also brings along some questions as it may or may not be attached to the top somehow as well. Again, I have NO idea! So, I’ve been told that a skirt-over-pants was somewhat in fashion at the time, but still, it’s just confusing. From what I can tell, its a loose pair of short, black capri pants under a black skirt with red piping. My question is, was this a common occurrence? Are these items meant to be together, or was this a Birds of Prey special? NO CLUE what is happening here? Appears to be some kind of heeled boot with the black/red accents thing going on and red socks. Are these a real shoe? I mean, it seems most likely that the crew would have bought off the rack, but I have never once seen a shoe like this anywhere in the real world. Just another part of the mystery. So there it is. Kind of embarrassing that after 12 years, I still have no idea what this costume is, but that’s my cross to bare. Most likely scenerio here is that, for the final episode of this short-lived show, the costumers didn’t have any real time to make a comic-accurate Harley costume, and instead customized a red top and then got the rest off the rack, but I don’t know for sure. Of course, I’ve tried contacting some of the wardrobe department from the series, but was never able to get an interview, so the mystery lives on. Such a strange thing to be posting about, but its one of those things that happens when you are obsessed with a show that came and went for so many others. Sometimes, you just have to be the crazy. The word is out. 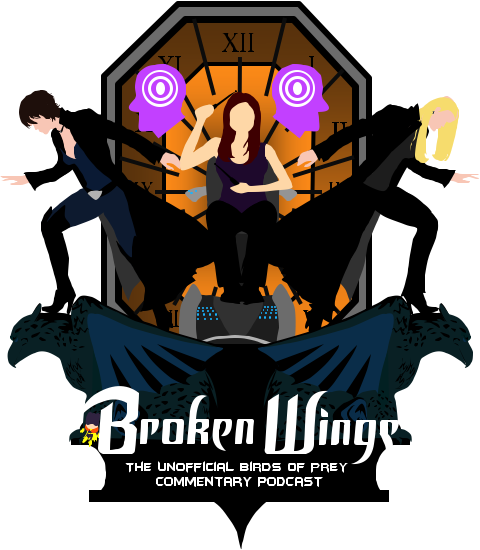 Broken Wings: The Unofficial Birds of Prey Commentary Podcast returns September 8th with a very special interview with the Huntress herself, Ashley Scott! 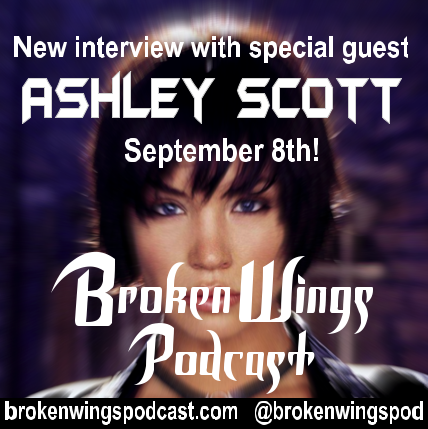 There are no words for how excited I was to talk with Ashley and to get this interview out to her fans. 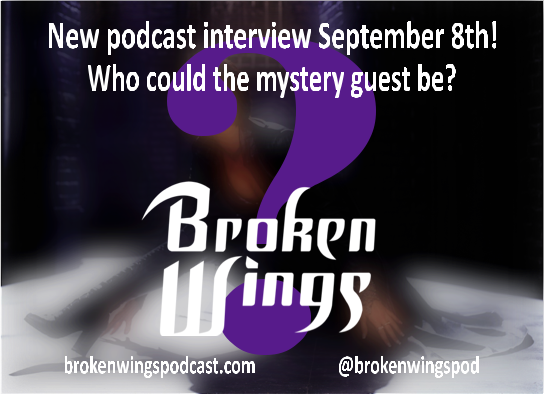 Check back Tuesday, September 8th for the new podcast and subscribe to Broken Wings on iTunes. Fans of Ashley Scott should also check out ashleyscott.com and follow Ashley on Twitter, @IAmAshleyScott. New Podcast Interview Coming Tuesday, September 8th. 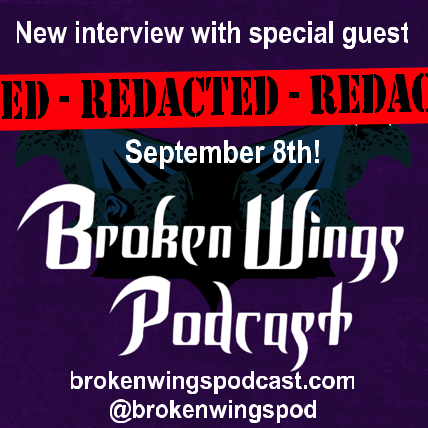 Look out for an all new Broken Wings interview podcast coming Tuesday, September 8th with a very, VERY special guest. Stay tuned!